Morris, Jan Conundrum London: Coronet Books, 1975. 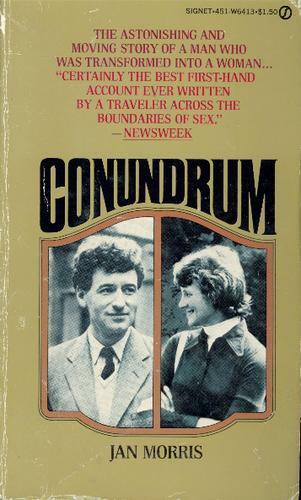 Conundrum is an autobiography, a tale about the life and transsexual journey of Jan Morris, noted British journalist and author. Born Humphrey Morris, Jan led an idyllic if somewhat lonely childhood, feeling since age 3 or 4 that she was born into the wrong body. She is sent off to Oxford at the age of 9 to take choral lessons, and her descriptions of Oxford are also idyllic (sidebar – in the biography of transwomen April Ashley, I noted she described Oxford in a manner similar to Morris!) She waxes poetically about a sense of spirituality connected to her female soul, praying in the Cathedral to be a girl. She moves on to Lancing in WWII, where she starts to have homosexual relations with prefects of the school, and experiences greater gender dysphoria. She enters WWII near the end, feeling she says like “one of those unconvincing heroines of fiction who, disguised in buskins or Hussar’s jacket, penetrate the battlefields to find glory or romance.” In the army she finds that she’s giving off a “vibe” that makes men – and women – want to take care of her. After the war Morris enters a period of deep introspection, trying to reconcile her transgender feelings with spirituality and mysticism. She researches what little is known about transsexualism – the Chevalier d’Eon du Beaumont, the Abbe de Choisy, and finally the story of Lili Elbe (although in her book Morris mischaracterizes Lili badly; having just read Lili’s biography, this error stood out). Morris meets the famous Dr. Harry Benjamin, but oddly receives advice to try to just accept herself how she is, and not rush into any change. Morris starts on hormones, then suffers a crisis of confidence and quits, something which she repeats through her life. Through great fortune she meets a woman, Elizabeth, who marries her knowing full well she is transgendered, and they even go on to have five children together. Although she loves her children and wife, she finds very quickly she cannot settle down, and while remaining married feels like an outsider of sorts in her own family. This didn’t last, and by her mid-30’s she’s on hormones again (soon quitting) to get rid of the maleness she had come back in touch with. She relates her despair as she sees male middle age coming and feels caught in a ticking trap, wondering if her female soul will be destined to die in a male body. She cringes every time someone says something like “you wouldn’t be interested in this, it’s women’s talk.” This part was very powerful for me personally, as it’s how I felt right before I had the crisis which led to my starting my own transition. She writes about her travels in Venice and Africa (Morris is most known for her travel books) and brings bits of her own feeling of submerged femininity into each tale. A Xhosa wise woman tells her she will someday be female, and years later she tells of her transition, re-starting and staying on hormones in 1964. The change due to hormones is slow but wonderful, rejuvenating and gives her a new life and energy. Exactly as I went through when I started (and I still feel like I’m 14 most days!) She describes in detail all of the physical, mental, and emotional changes which slowly occurred, and I found myself nodding and checking off my own list alongside her. As well as the changes in reaction of people around her, especially strangers, as she becomes more feminine. This is again what I’ve experienced, where sackers are the grocer’s now go out of their way to help me with the bags, and when I struggle with a sack of cat litter at Wal-Mart, instead of being ignored, someone will come running up to help me. At times the stories of the way people have trouble figuring out how to treat her did make me laugh. Her reports of how different cultures perceived her androgyny were very interesting to me, yet again something which I’ve personally experienced when overseas. She does suffer from some doubt and dysphoria as her body transitions, feeling like a hermaphrodite, or even “like a figure of mythology, monstrous or divine…” She writes of trouble at passport control, where even in “boy mode” she’s treated as female (been there…). Her transition gives her a new sense of spirituality and makes her feel that while she is separate from the rest of humanity, she’s also special and beautiful, and despite the greater turbulence of social constructs, inside she is calmer and more at peace than she’s ever been in her life. She switches from “girl mode” and “boy mode” depending on the circumstances. Her neighbors are accepting, and she speaks a bit on how good female clothes feel (they do!) in that they feel right. Morris is smart and takes a slow, steady strategy of introducing friends and business associates one by one, to make the transition to fully female as gradual and painless as possible, a strategy which I have also followed. Then comes her SRS in 1972. Morris tries to have surgery in England but finds the closed-minded doctors in England insist she get divorced before they will approve the surgery. It’s a stunning piece of insensitivity which she and her wife (wisely) refuse to play along with, so Morris is travels to Casablanca instead. She writes in great detail about the experience, something which is nice – many transwomen really do not like to write about their experience in their biographies (and those who do, like Aleshia Brevard and Canary Conn, have horrifying experiences which make you want to curl up under a blanket and rock in place). Her surgery goes well and her life is further transformed into complete happiness and wonder. Morris finishes the book by describing her new life, and especially how she was treated differently – mostly better, sometimes worse – for being a “real” woman in upper middle-class English society. Her reflections on the differences after her SRS are very intriguing, in fact, and she details her life as a new woman, a life which is happy, full of wonder, and featuring no regrets whatsoever. The story of Jan Morris is an uplifting success story. As Morris is a highly educated person, her autobiography is written at a somewhat high level, with literary, artistic, and mythological allusions throughout. Her book is touching, sensitive, witty and pithy at times, and easy to read. There are many rather profound quotations which I plan on re-using when the opportunity permits. And I was shocked at how similar her feelings and experiences were to mine, and felt like connected to her on a level stronger than any of the score of more transwomen’s biographies which I’ve recently read.